Heaven knows I don't need another blush, I have a tonne of them! But this is a blush I'd been eyeing off for a while so when I saw it come up at a blog sale I had to get it. I am of course talking about theBalm blush in Frat Boy. Frat Boy is a matte, highly pigmented blush and is the type of shade that every person needs to own, as it goes with a variety of eye and lip looks. It's described as peach/apricot but I'd say it's more of a warm pink on my skin tone. Just like my other theBalm blush (InStain in Argyle which I reviewed HERE) it comes in a quirky cardboard packaging. I love packaging like these as they're very slimline and light weight, so perfect to slip into my handbag. This blush is about $28 from David Jones, or you can also pick them up for $21 from theBalm website which has international shipping. Have you tried anything from theBalm before? Any recommendations? 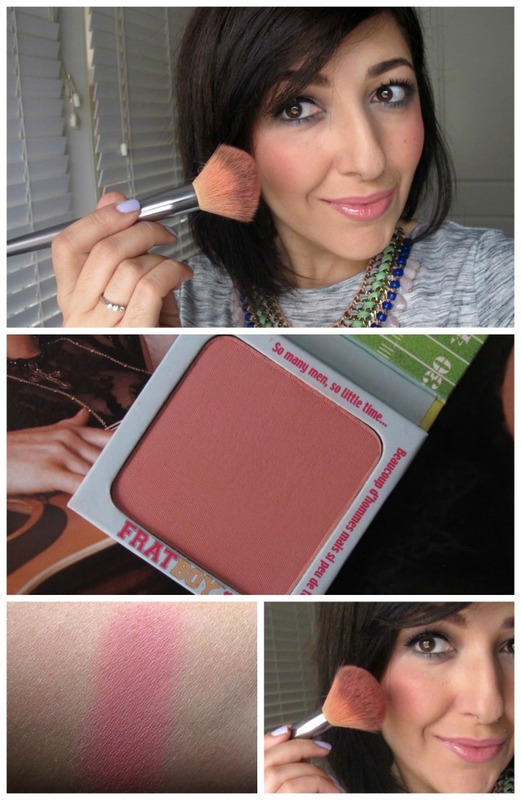 This blush looks really good on you! I feel like I need this. I have only tried the Mary-Lou Manizer and cannot get enough of it. It's the most beautiful highlighter and judging on the quality and pigmentation of it I want to try more from The Balm brand! Thanks Kirsten, I'm really happy with theBalm brand so far and the prices are really reasonably too! I haven't tried the Manizer yet, but it is on my list! I have been reaching for this blush a lot recently. On my skin it looks like a candy pink but I love how girly it makes me look. Ooh that sounds nice, candy pink. Perfect for a girly flush! It's amazing how it can look different colours on different skin tones. Hi - I have this blush and love it too! If you don't mind me asking where did you get your necklace from? It is lovely. Hi Nicole, it's from Lovisa but it was from around Christmas time and it was on sale, so not sure if they'd still have them in stock.